Rabbit Agility is much like dog or cat agility only the equipment is made smaller for a rabbit and stable enough for the rabbit's weight while manipulating the pieces. 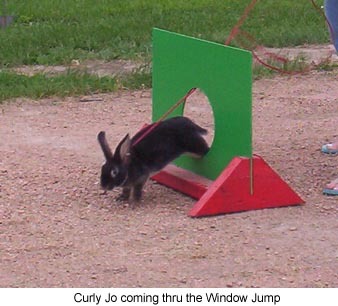 Rabbits learn to run an agility course just as a dog and/or cat might. Animal agility (dog, cat, rat, rabbit or other) is a course of equipment in a ring that an animal will maneuver: over, under, around and through in a timed event/race. The animal that completes the course without upsetting equipment with the fastest time wins the event. Agility is fun and exciting for the animals, handlers and spectators. Dog Agility was started in 1978 at the Cruff's Dog Show as entertainment for spectators. Dog agility was modeled after Horse Steeplechase. From there it caught on quickly and evolved into many different agility dog clubs with different agility competition rules and different types of equipment. Soon other animal owners thought it might be fun to teach to their species agility courses. You can now see cats, rats, rabbits, as well as dogs, and other animals running agility course for fun and in competition. Domestic Rabbits can be very affectionate and intelligent animals. Rabbits can be taught tasks, tricks and behaviors. People are finding what clean, intelligent and affectionate animals rabbits are. Many people are keeping rabbits as pets, some people even have house rabbits that use a litter box, so Rabbit Agility as well as other sports and activities with pet rabbits are becoming more popular. Rabbit agility is different from rabbit hopping. Rabbit hopping is also called rabbit jump/jumping and show jumping. Rabbit agility is usually done off leash on a course of many types of agility equipment that the rabbit manipulates by going over, under around or through. Rabbit hopping/jump/jumping is one or a series of jumps that the rabbit hops over. The rabbit is kept on leash for these events and is encouraged to jump far and high. Rabbit hopping or sometimes called rabbit jumping is very popular in Scandinavia, the United Kingdom and Germany where competitions can be found about every week end and may have as many as 200 rabbit participants. The lengths and heights that the rabbits jump are amazing. At first glance rabbit agility and rabbit hopping look to be much the same sport. They are in fact different sports. In rabbit agility the animal learns to manipulate many types of agility equipment, many fashioned after dog agility equipment. The rabbits learn to go over, under, around and through the different pieces. Rabbits are worked on or off leash depending on the individual events rules or if the course is fenced or not. In rabbit hopping the equipment are all jumps. The idea is to jump far and wide. The course could have one or many jumps set up for each rabbit to jump over. Rabbits in rabbit hopping are worked on leash. This site will focus on rabbit agility, however, most of the information within could also be used for training your rabbits for rabbit hopping. Both events are timed events with the rabbit having the least course errors and the fastest time being declared the winner. Leash training is important for both events and any trained rabbit to learn and in fact may be one of the first thing that they learn. WHAT BREED IS BEST FOR COMPETITION? Like dog agility, any size or breed of dog can participate. Tiny dog breeds as well as giant dog breeds may manipulate the equipment (made for their size) well, but would not have the speed to win at a competition. The same is true of rabbits. However, because the smaller rabbit breeds are the most popular as pets, you will see many of them competing in rabbit agility and rabbit hopping. There are a few breeds that would not be good, in our opinion, for rabbit agility or rabbit hopping. An English Lop with huge ears would not be able to manipulate the agility equipment well. 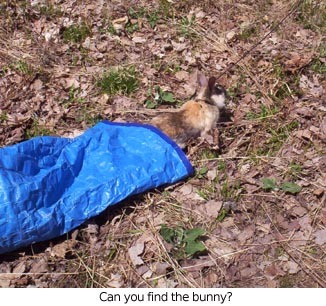 It's ears would likely get caught in some of the pieces of equipment, or it could step on it's own ears while running and turning, the rabbit could be seriously injured. The Angora or Wool/Long Haired breeds would more then likely be a mess by the time they finished an agility run on an outdoor course. Their wool will pick up leaves, sticks and other matter. Trained and competing indoors some Angoras may well out do other breeds. Hairless Rabbits would likely get cold or hot at an event. They also would not have the fur to protect them while running through the courses. 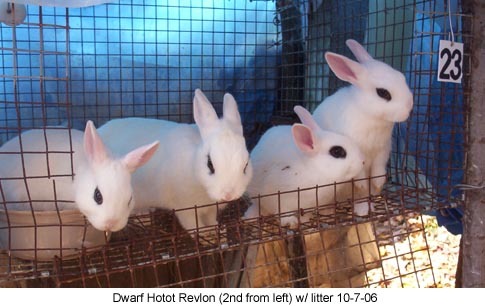 The Giant breeds may not do well as Rabbit Hoppers because the constant jolts to their joints would be hard on their health . However with the correct sized agility equipment and only a few jumps they may do well at rabbit agility. The more active and racier breeds would be a better choice for rabbit agility or even rabbit hopping competitors. Many people prefer rabbits about or just under 7 pounds. Please visit often as this site, as well as www.theagilerat.com and www.marnasmenagerie.com, are STILL UNDER construction. Thanks for your visit!